Berggruen Gallery is pleased to present Alexander Gorlizki: Together, Forever, For Now, an exhibition of recent works on paper, sculpture and design by New York City-based artist Alexander Gorlizki. This show marks Gorlizki’s second solo exhibition with the gallery and will be on view November 29 through December 24, 2018. The gallery will host a reception for the artist on Thursday, November 29 from 5:00 to 7:00pm. 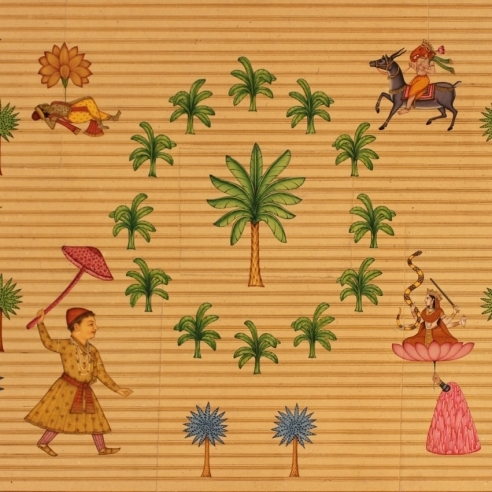 Gorlizki’s works on paper, upon one’s first cursory glance, appear to be highly detailed and ornamental Indian miniatures, made with undeniably extraordinary skill. After passing one’s eyes over the works briefly, one’s head snaps back in realization that what appeared to be traditionally-attired princes sitting atop horses in intricately patterned courtly surroundings, are in fact amalgamized creations, part man, part lion or finch or elephant, riding on the back of a pigeon or rhinoceros or seal patterned with tiger print in an imaginary world of Gorlizki’s own making. He utilizes textile patterns from Japan and Malaysia, photographs of Hollywood darlings, Hindu spiritual imagery, illustrated Victorian handbooks, and cosmological diagrams, each recontextualized and combined to create a new narrative. The traditional is in fact the whimsical, the absurd, a world of the fantastic where nothing is as it appears. Scale is abandoned in favor of intrigue. History is set aside to give way to the unexpected, a delightful pastiche of seemingly incongruous objects and patterns from different times, places and fields that juxtapose and combine together to envisage a witty world of the imagination that is simultaneously celebratory and subversive. Gorlizki is inspired by a myriad of sources, including Eastern and Western, historical and contemporary, artistic and everyday. Each work, filled to overflowing with infinitesimally precise details, invites one to get close and examine it and appreciate not only the humor and irony of the people, creatures, places and patterns depicted, but also the immensely talented abilities of the human hand that rendered the work itself. Having discovered a love of Indian Miniature painting, but wanting to use it toward his ends, in 1996, Gorlizki established a studio in Jaipur, India with the master miniaturist painter Riyaz Uddin. Uddin and the other artists in his atelier, each with his own expertise, are renowned for painting with a single-hair-tipped brush in the 600-year-old Mughal miniature style. Gorlizki himself focuses on the conceptual, imaginative and formal aspect of the image, which he draws onto antique or distressed papers and photographs. He then passes each sheet off to the miniaturists, who apply the pigments and gold leaf. Gorlizki adapts and working side by side in the studio or shipping images back and forth between New York and Jaipur, the paintings evolve layer by layer, often over a period of years. In this way, each work is a collaboration, a trans-global dialogue between artists that results in a richness that spans time and space to create something uniquely of our time. While rich and complex enough to constitute Gorlizki’s entire artistic output, the artist’s creativity is not limited to the two-dimensional. Alexander Gorlizki: Together, Forever, For Now will highlight a selection of Gorlizki’s sculptural works. In these small sculptures, whether painted wood, cast brass, marble or found object, Gorlizki further articulates his narrative, questioning perception. These intriguing and playful sculptures pull Gorlizki’s subjects from his two-dimensional painted miniatures into the viewer’s space, allowing one to interact with the subject as an object itself. Gorlizki’s sense of humor is blatant and infectious when one examines his amorphic and whimsical sculptures, from his ornamentally and brightly painted wooden pieces that twist and turn in space to the small brass monsters, each with his or her own name–Bev, Gus, Mel and Ned. The meticulous patterning of these miniature paintings, too, is brought to life, as one wall in the gallery is wallpapered with Gorlizki’s design, a complex pattern of black, white and gray. It is when Gorlizki’s body of work is seen collectively–the works on paper beside the sculptures in front of the walls festooned with the artist’s own wallpaper–that one is truly able to appreciate the witty, ironic, subversive and playful world, truly manifold, that Gorlizki imagines and it is within this world that one is encouraged and prompted, to reexamine one’s own perception. Alexander Gorlizki was born in London in 1967. He received his B.A. from Bristol Polytechnic and his M.F.A. in sculpture from the Slade School, London, U.K. His work is included in the collections of the Victoria & Albert Museum, London; Collection Antoine de Galbert, Paris; the Royal Ontario Museum, Toronto, CA, the Museum Kunst Palast, Düsseldorf, Germany; Denver Art Museum, Denver, CO; Aspen Art Museum, Aspen, CO. Recent solo exhibitions include Galerie Martin Kudlek, Cologne, Germany; Pink City Studio, Beyond Malabra Gallery, Kochi, India; Variable Dimensions, Crow Collection, Dallas. Recent group exhibitions include “living a dream…” alexander gorlizki / magic makings / gugging artists, Galerie Gugging, Maria Gugging, Austria; Washington 186, Aeroplastics, Brussels; Thinking Tantra, The Drawing Room, London (traveled). Gorlizki lives and works in New York. Alexander Gorlizki: Together, Forever, For Now, November 29 – December 24, 2018. On view at 10 Hawthorne Street, San Francisco, CA 94105. Images and preview are available upon request. For all inquiries, please contact the gallery by phone (415) 781-4629 or by email info@berggruen.com.